Download "Project Title slide Project: PCI. Are You At Risk?" 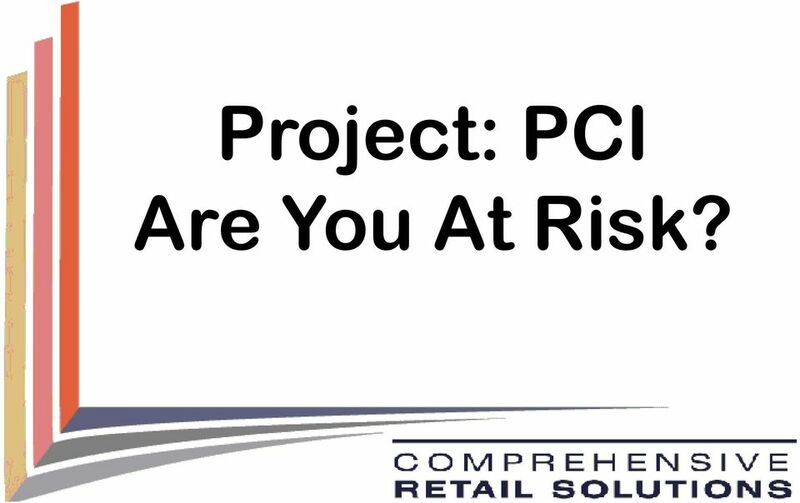 2 Project Title slide Project: PCI Are You At Risk? 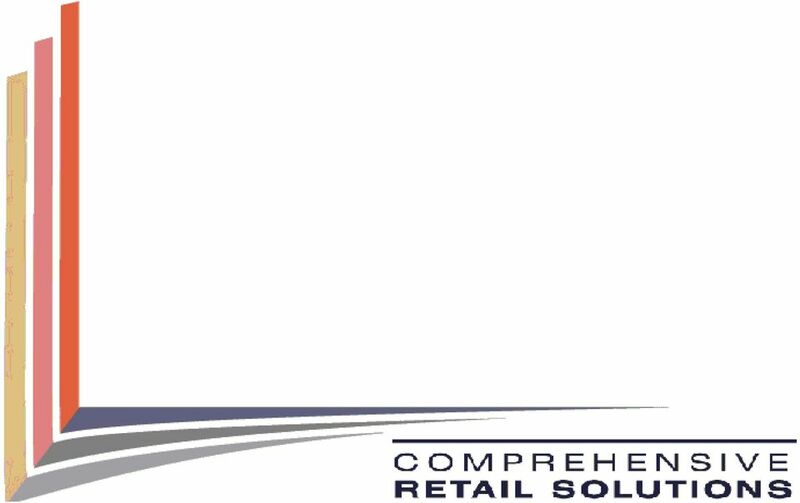 4 Disclaimer CRS is providing this information as a service to its customers Information provided is not intended to be an assessment of a customer s current compliance status Disclaimer CRS is not a QSA and therefore will never indicate to a customer that they are PCI compliant. 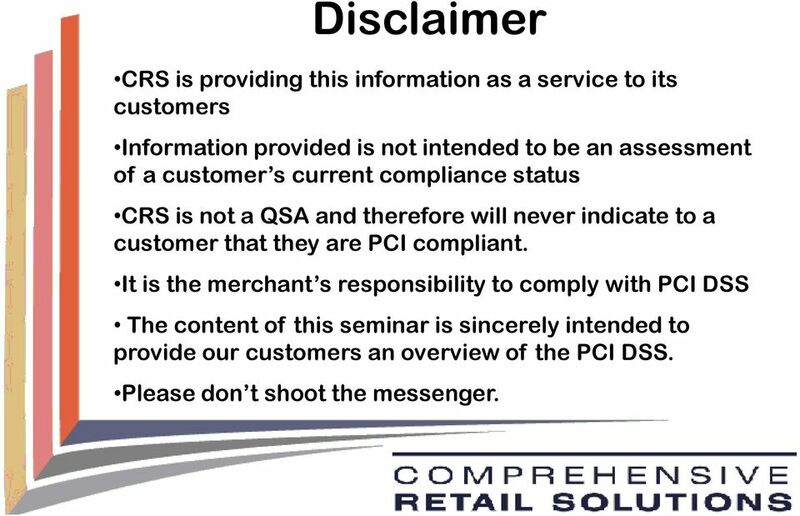 It is the merchant s responsibility to comply with PCI DSS The content of this seminar is sincerely intended to provide our customers an overview of the PCI DSS. Please don t shoot the messenger. 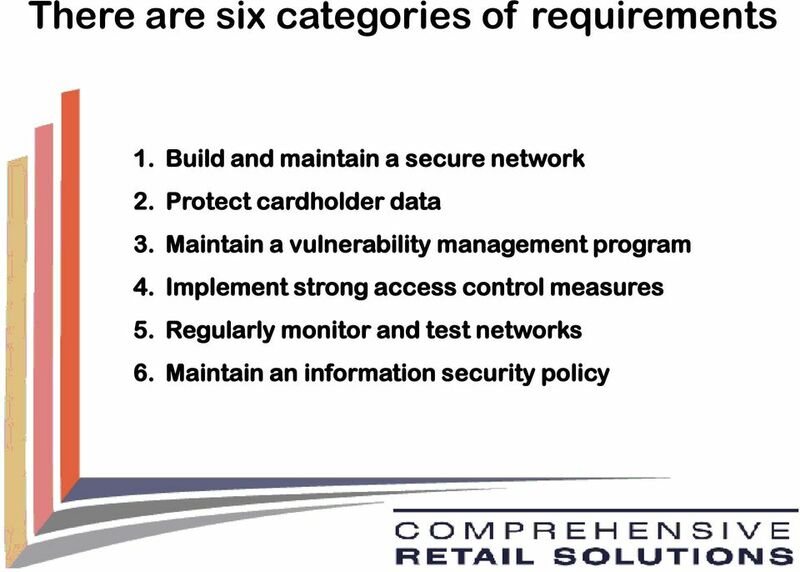 6 PCI DSS requires the use of compliant payment applications. Developers pay to get their applications validated as being compliant. They then also pay the PCI SSC to get their validated applications listed on the website. A payment Validated vs application may be compliant but not validated or listed. 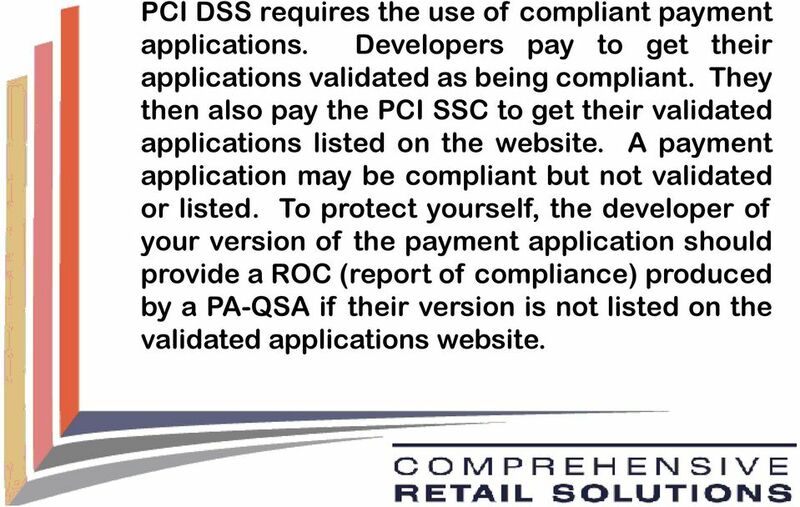 To protect yourself, the developer of your version of the payment application should provide a ROC (report of compliance) produced by a PA-QSA if their version is not listed on the validated applications website. 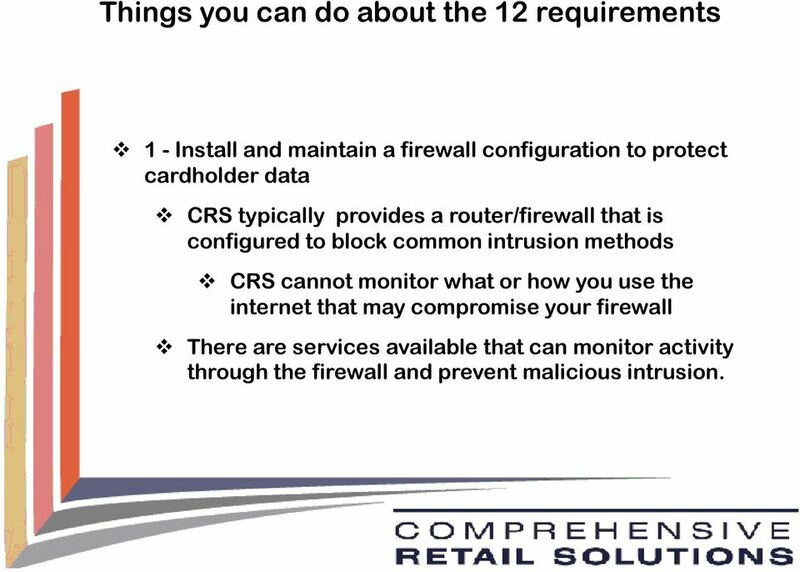 15 Things you can do about the 12 requirements 1 - Install and maintain a firewall configuration to protect cardholder data CRS typically provides a router/firewall that is configured to block common intrusion methods CRS cannot monitor what or how you use the internet that may compromise your firewall There are services available that can monitor activity through the firewall and prevent malicious intrusion. 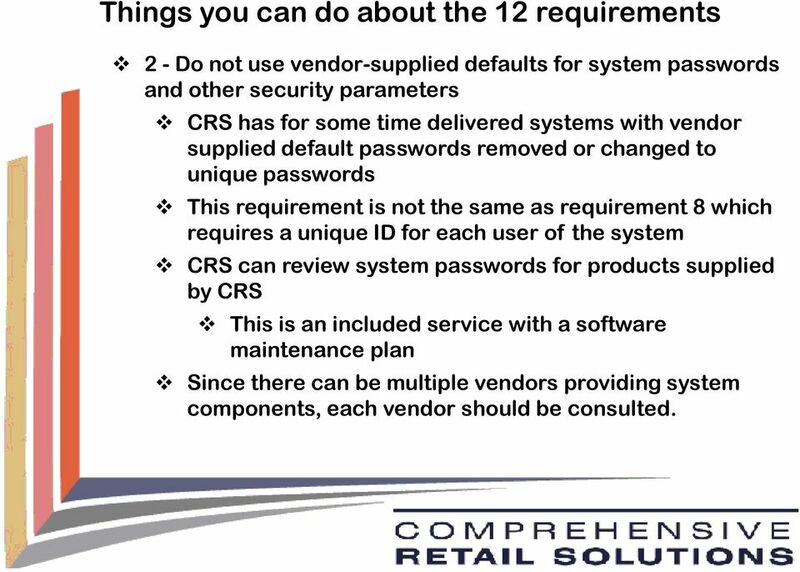 16 Things you can do about the 12 requirements 2 - Do not use vendor-supplied defaults for system passwords and other security parameters CRS has for some time delivered systems with vendor supplied default passwords removed or changed to unique passwords This requirement is not the same as requirement 8 which requires a unique ID for each user of the system CRS can review system passwords for products supplied by CRS This is an included service with a software maintenance plan Since there can be multiple vendors providing system components, each vendor should be consulted. 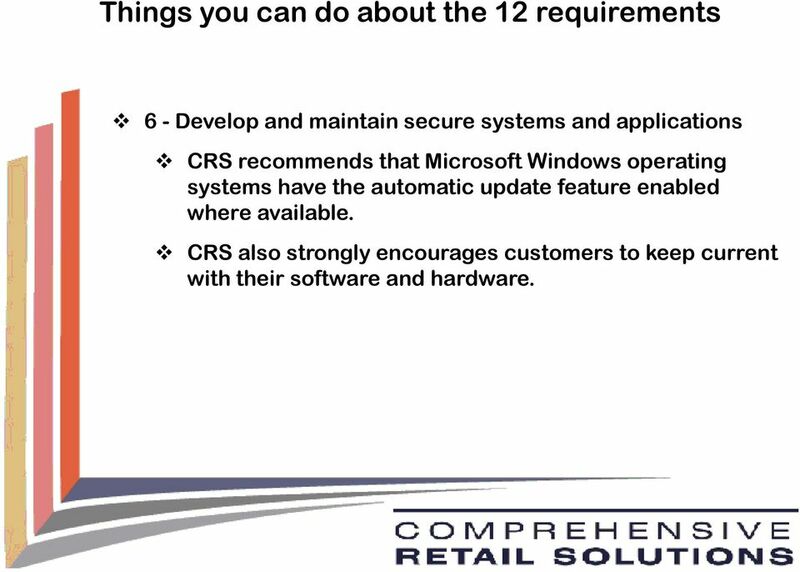 20 Things you can do about the 12 requirements 6 - Develop and maintain secure systems and applications CRS recommends that Microsoft Windows operating systems have the automatic update feature enabled where available. 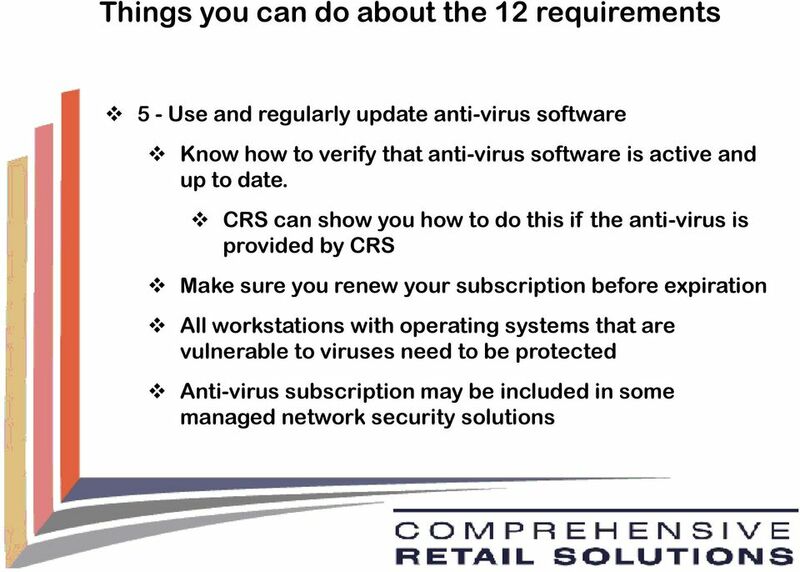 CRS also strongly encourages customers to keep current with their software and hardware. 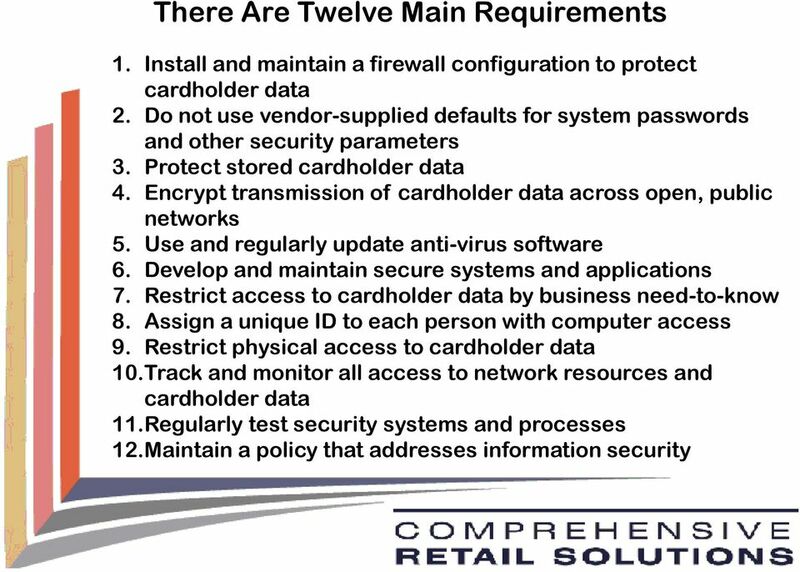 24 Things you can do about the 12 requirements 10 - Track and monitor all access to network resources and cardholder data CRS doesn t monitor log entries. CRS does not review logs Other than hard drive backup strategies, CRS does not provide log archiving. There are managed network services available that do these things. 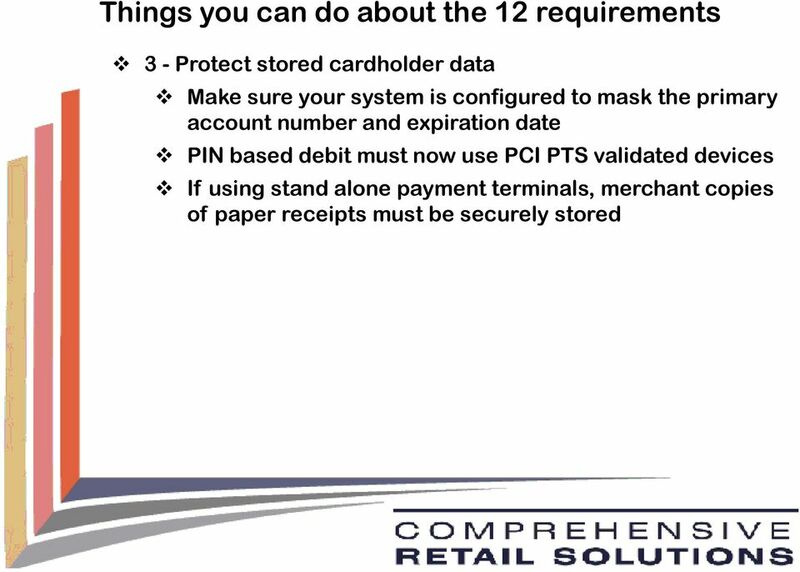 26 Things you can do about the 12 requirements 12 - Maintain a policy that addresses information security Most acquiring banks and card processors have resources available to the merchant to develop these policies. 29 What s The Price Of Not Complying? VISA - since 2005 more than 80% of the instances of data breaches involve small businesses. Contractual penalties and/or sanctions including fines up to What s $500,000 per the incident price and revocation of not of a company's right to accept or process credit card transactions. complying? Computer Security Institute - Average reported loss for an individual company in 2006 was $167,713 not including liability in civil suits (lawyers, court fees, etc.). Gartner Group estimates data breaches cost $140 per customer. PCI Compliance at The University of South Carolina. Failure is not an option. Rick Lambert PMP University of South Carolina ricklambert@sc. Payment Card Industry Data Security Standards Compliance Please turn off, or to vibrate, all cell-phones/electronics Expected course length: 1 Hour Questions are welcomed. Who Created It? & What Is It? This appendix is a supplement to the Local Government Information Security: Getting Started Guide, a non-technical reference essential for elected officials, administrative officials and business managers. PC-DSS Compliance Strategies 2011 NDUS CIO Retreat July 27, 2011 Theresa Semmens, CISA True or False Now that my institution has outsourced credit card processing, I don t have to worry about compliance? 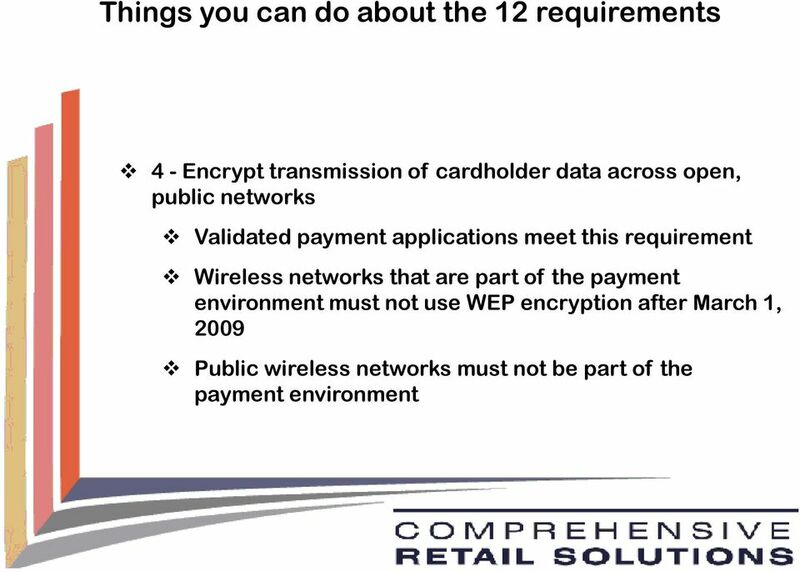 worldpay.com Understanding the 12 requirements of PCI DSS SaferPayments Be smart. Be compliant. Be protected. 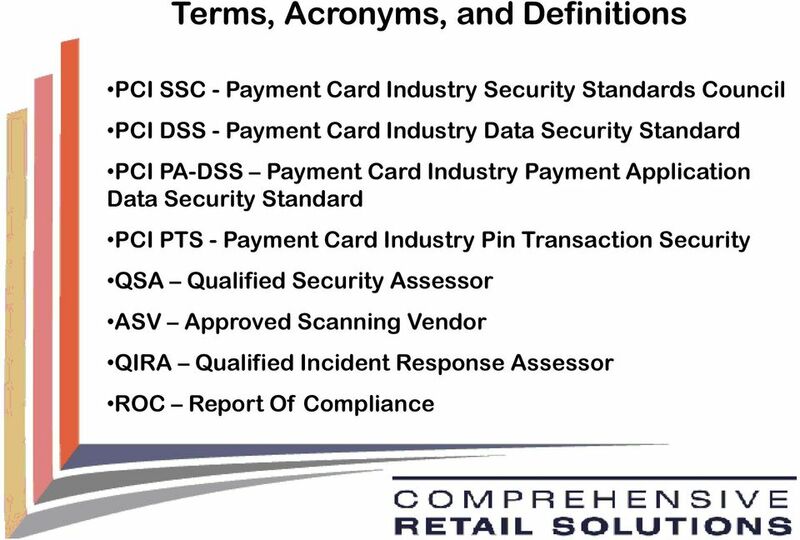 Appendix 2 PCI DSS Payment Card Industry Data Security Standard Merchant compliance guidelines for level 4 merchants CONTENTS 1. 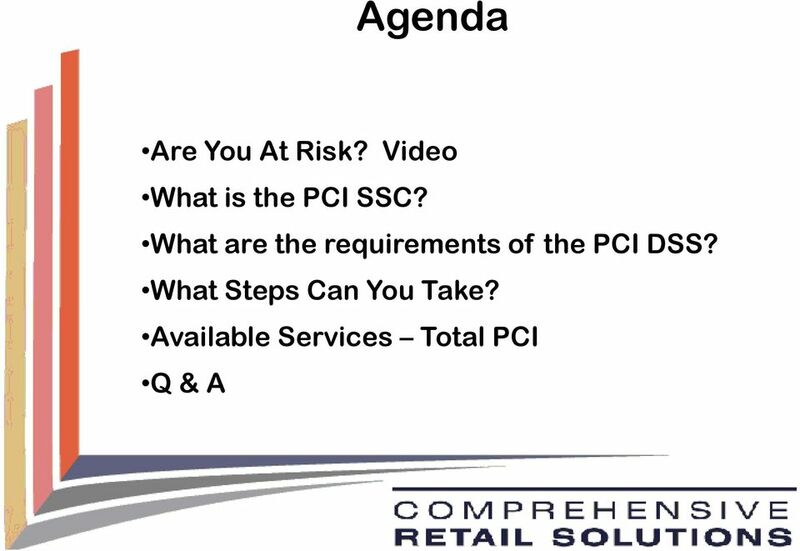 What is PCI DSS? 2. 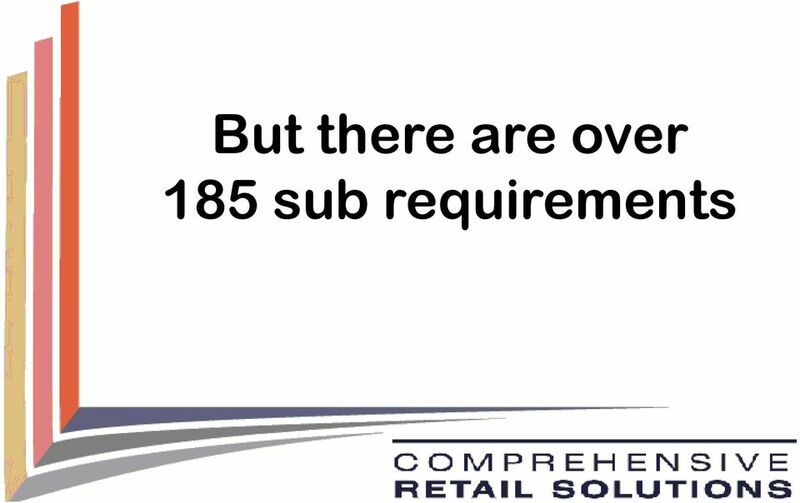 Why become compliant? 3. What are the requirements? 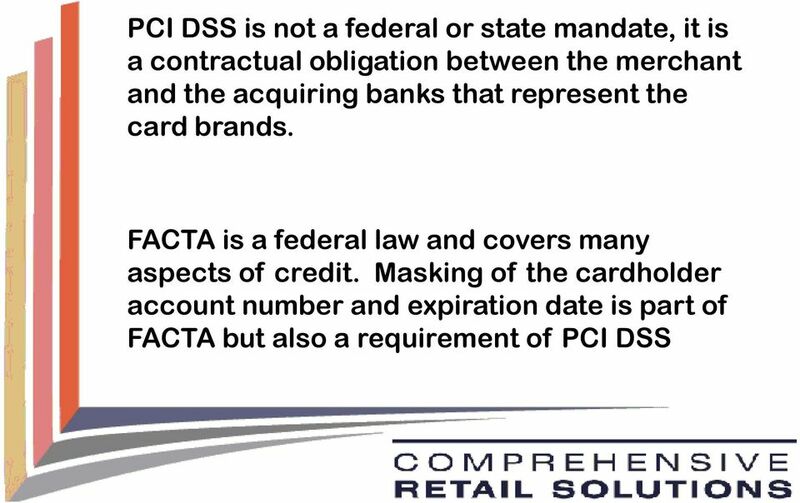 Month-Year Introduction to PCI DSS March 2015 Agenda PCI DSS History What is PCI DSS? 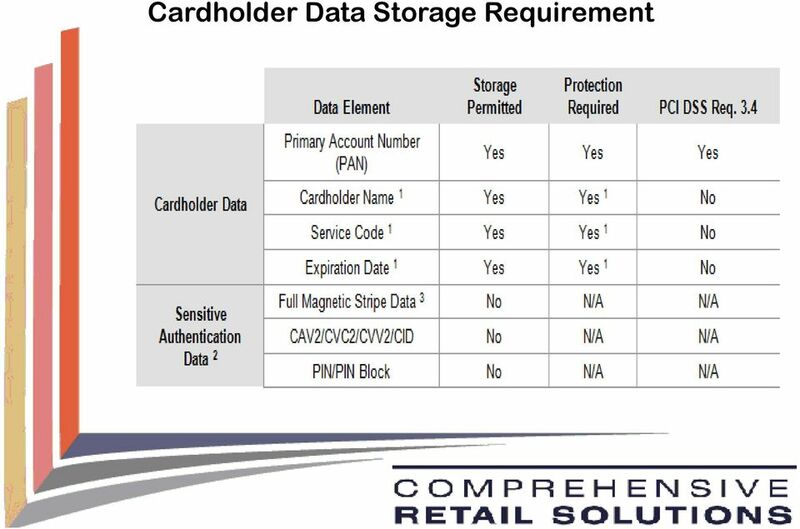 / PCI DSS Requirements What is Cardholder Data? 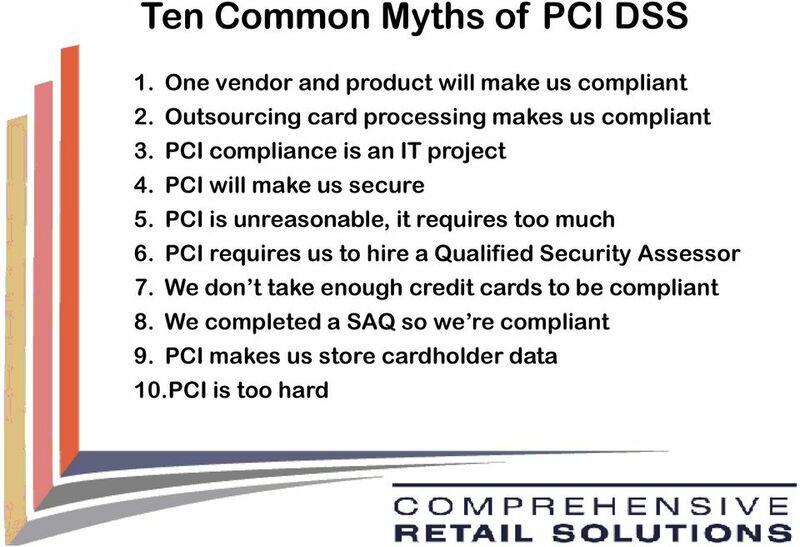 What does PCI DSS apply to? 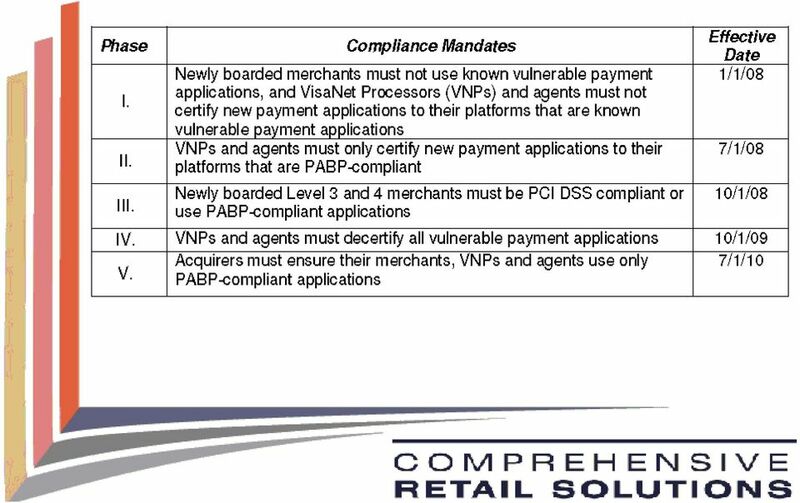 Payment Ecosystem How is PCI DSS Enforced? 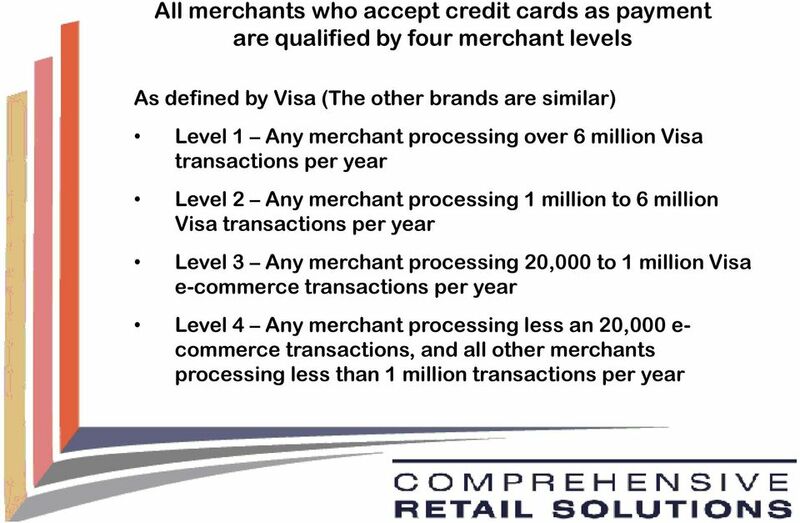 So you want to take Credit Cards!